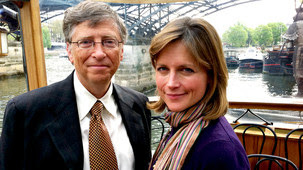 There are some NGO’s in the aid sector who do not accept funding from the Gates Foundation, such as Medicine Sans Frontiers, concerned for the the immense political power and global influence that it now wields and unable to accept a private organisation setting the aid agenda on a global scale. To recap, Bill Gates retired from the day-to-day running of Microsoft and set about distributing his fortune in 2008 through the fund, ‘topped up’ by $31 billion pledged over ten years from Warren Buffett. It is the world’s largest grant-giving organisation, giving away up to $4billion a year. Gates’ addressed the G20 summit in 2010. What concerns some is the Foundation setting tightly focused objectives; improve American Education, eradicate malaria, TB and polio. The Foundation is run on business lines, like a corporation, yet is answerable only to the three trustees; the Gates couple and Gates’ father. As host, Katie Derham was barely in the show and it was hardly her most penetrating piece of journalism. Derham’s portrait of Gates softened the former view of the ruthless businessman, monopolist and oligarch, and in conversation, Gates appeared genuinely affected by the privations he saw in the Third World. It did give some time to the critics who believe his corporate approach to charity distorts priorities, funnels research into narrow channels, allows Governments off the hook, and causes a brain drain in countries into which the Fund pours money beyond any form of accountability. There was also a hint at the distrust of some of the Foundation’s staff, with assorted accusations of arrogance, naivety and personal ambition. Producer: David Prest, A Whistledown Production for BBC Radio 4. This write-up very pressed me to listen. Thank you, very nice article. Great post. Thanks and best of luck. Gates is kind of inspirational. If only MS didn’t keep behaving so badly. Good information. Thank you for posting this.